There's always a bigger fish and now that seems to go for garden gnomes too. Sure to cause a total panic or at least a few double-takes, this cool new Giant Garden Gnome from Design Toscano is a truly massive eight and a half foot tall garden gnome statue that not only towers over the average gnome, but humans as well. Each gigantic gnome (a bit of an oxymoron) is cast in quality designer resin and then hand-painted in artistic detail. 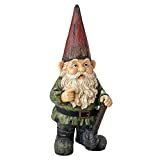 You could place this monster in your backyard garden to ward off other gnomes and hungry pests, stick it next to the fence to peer over into your neighbor's yard, display it proudly in the middle of your living room, or, if you run a store, it makes a great photo-op to take selfies with. You can even rub its nose for good luck, but you might need a step ladder.